This Minute is meant for Boy Scouts. So, you don't know the person, but his image is very well-known. 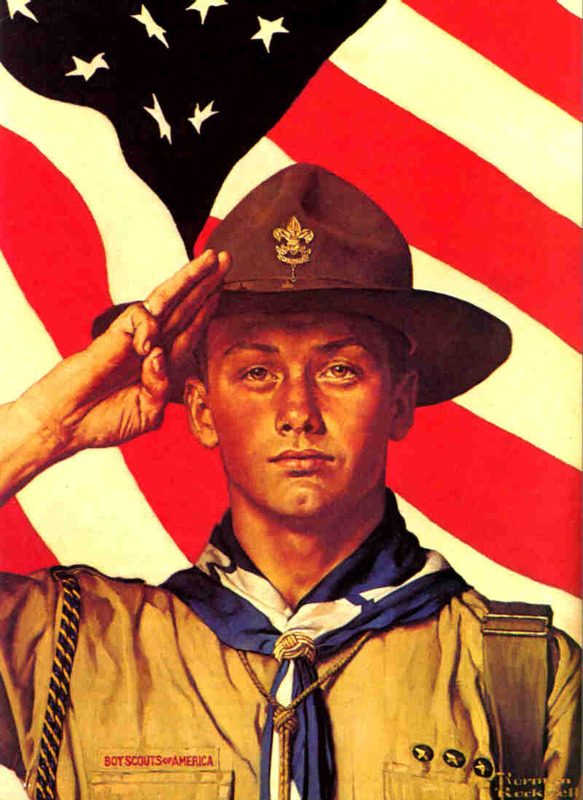 This scout's name is Bob Hamilton and this picture was painted by Norman Rockwell in 1944. The title is "We, Too, Have a Job To Do" and was used to rally scouts to volunteer service during World War II. Bob Hamilton died on July 28, 2008. He was 82 years old. He earned his Eagle when he was 15 and was involved with the Boy Scouts his entire life. Just as this picture defined "Boy Scouts" for many years, Boy Scouts defined Mr. Hamilton's life. This image was a role model of what people expected to see in a scout. None of you will pose for a famous painter and become the next national Boy Scout image, but each of you have a strong impact on the people around you. You older scouts - do you remember some scout in the troop when you first joined that seemed to be just what a scout should be? Someone that portrayed this image of a scout? How about you younger scouts - who is showing you what it means to be a scout? Which of these people here is standing in this picture for you? There's no way you can avoid it. We all learn from each other and we're always watching. Each of you are standing in this picture - you just need to decide what the picture you portray looks like.